Michael Schumacher remains in an induced coma and his critical condition has been described by doctors as 'extremely serious' following his skiing accident on Sunday. The seven-time world champion suffered a severe head injury after hitting his head on a rock, and is currently undergoing treatment in a hospital in Grenoble. During a press conference on Monday morning, the doctors looking after Schumacher made it clear just how serious Schumacher's injuries were, and said it was too early to offer a prognosis. Professor Jean-Francois Payen said: "I would say that this accident was particularly serious and was dealt with immediately at our hospital. "He was immediately operated on after a brain scan and afterwards his condition is critical. "As far as cerebral care [is concerned], all the recommended treatments have been introduced, but for the moment we are not able to express ourselves with regard to Michael Schumacher's future. "He is in a critical condition and his condition is said to be extremely serious. He is in intensive care." The medical team confirmed that Schumacher was being kept in an induced coma to help his chances of recovery, having being operated on after it was found he had suffered cerebral contusion and edema. He has also suffered lesions to his brain. The severity of Schumacher's injuries and his current condition means doctors are unable to make any predictions about whether or not the German will be able to make a full recovery. Payen added: "We are currently not able to talk about after effects. We are talking about treatments and working hour-by-hour. "We are going to try to gain time, and try to give ourselves some time. The treatments that are going to be introduced, we know what we are hoping for from these treatments. "But currently I am not able to give you any more information, and cannot tell you what direction we are going in or what prognosis we are going to have." 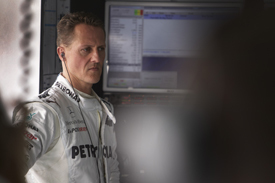 Doctors do believe that Schumacher's fitness should help his chances of recovering though.